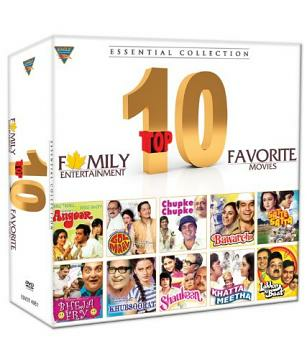 10 all time favorite hindi movies in one convenient gift back. Ideal as a gift during the holiday season or for your own DVD collection at home. Buy 2 or more and SAVE even more. This item in Indian Movies DVD category was first added to our catalog on 11-17-2015. Buy 10 DVD Family Entertainment - Hindi Movie Gift Pack, sold & shipped by JSM MUSIC where you can shop online for Hindi Movie DVDs & Bollywood Music Audio CD & MP3, Discounted Indian DVD. This Hindi Movies collection has been tagged as holiday gift set, comedy, family drama, bollywood cinema, hindi film dvd.